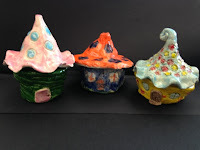 Ms. Nasser's Art Studio: Gnome Homes! How can a simple form become the base for a unique sculptural work. 4th Grade artists are busy at work hand building whimsical clay gnome homes. 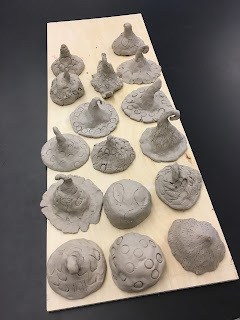 Students learned to use a basic pinch pot form as a starting point for both the roof and base of their clay sculptures. Students also experimented with different textures to add designs and realistic details to their works. Mrs. Magrath's 4th graders turning pinch pots into creative roofs. 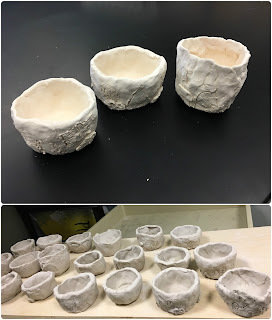 The next step was to use the same pinch pot technique to create the bottoms of the homes. Students carved in details like doors and windows. They also learned how to attach pieces of their clay using the slip and score method. Students attached door knobs, curtains, benches, and even tiny pairs of gnome shoes waiting outside the door. I loved seeing all of their creative ideas! and used the reverse color pallet for the bottoms. The finished projects were adorable and the students were so excited about them!